Artist’s impression of a bicycle chainy geary thing. I went out with Jane today. We’re married, I know, but we wanted to somehow re-live the excitement of those heady days of dating. Oh hang on! No. I hadn’t finished that first sentence. I’ll start again. I went out with Jane today on our bikes. That’s what I meant to say. I accompanied Jane on one of her training runs in preparation for Friday’s sponsored cycle from Glasgow to Edinburgh. It was at that point that I realised just how disgusting her chain was. It was as though a garden centre had staged a Bring and Buy sale there. The second incident was quite spectacular. On our return leg (the Colinsburgh to Pittenweem road) Jane’s gears started crunching as she changed down as we approached a slight hill. And then her chain came off. On the inside. 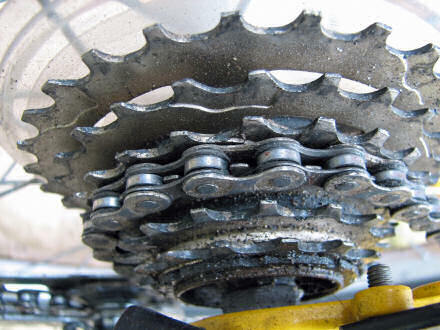 By which I mean it came off the cogs towards the frame, and well and truly jammed itself between the front chainrings and the frame. I couldn’t budge it. it wouldn’t move at all so I couldn’t locate the removable link. Whatever that was. I had no idea. “Can I do anything to help?” asked Jane, kindly. And prayer seemed to do the trick. That and some vigourous waggling of the chain and some excessive force on the pedals. (Oops!) Anyway, with the chain on, and the clicking starting up again, we managed to get back to Cellardyke in one piece. This evening we got the rubber gloves on, the bucket of soapy water filled, and were out in our wee courtyard cleaning the bikes, in preparation for my taking Jane’s bike in for a service tomorrow in St Andrews. Muc-Off is wonderful stuff, that’s all I can say. Examining Jane’s bike when we got it clean I discovered that she has five or six broken teeth on her front chainrings. No wonder she’s had trouble with it. I’m just glad that Jane’s bike will be getting a full and professional medical before she pedals her way from Glasgow on Friday, that’s all I can say. That and “Muc-Off is wonderful stuff”. Keep your lights bright and clean. Sure, but keep your chain clean too, that’s the moral of the story today, I think. I cleaned and re-lubed my chain too, this evening. Just in case. It’s all changed… and yet nothing has. Hoorah! My blog has changed completely, and yet nothing has. 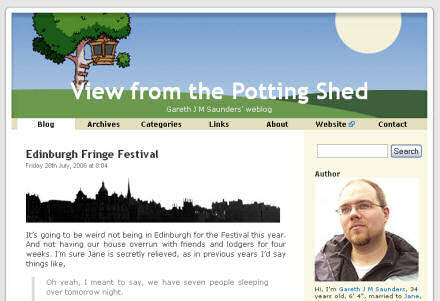 This evening I took a break from writing and upgraded my blog to the latest version of WordPress (2.0.4). And while I was at it I updated my plugins too. So now the backend (the bit I get to see) is happy and secure and the frontend (the bit you see) hasn’t changed a bit. If you’re running WordPress then I suggest that you do the same, it’s a significant security update and with excellent upgrade instructions on the WordPress Codex you’ll have it done in no time. (Remember to backup your .htaccess file, too.) You’ll thank me in the long run. Another reason for the late night (apart from essential blog maintenance) was that we were waiting for today’s guests for our holiday cottage. We were expecting them at 16:00. They phoned at 17:00 to say that they were in London, having flown in from Barcelona, and would get a flight to Glasgow arriving at 18:50. And then they called about twenty minutes later to say their flight was delayed. By three hours. They would now arrive in Glasgow at 22:00. And it’s 01:28 now and they’ve just settled in next door. Having driven into the harbour wall, in the pouring rain. I do hope their holiday improves. Posted on Sunday 30 July 2006 Thursday 14 December 2017 Categories WebTags Cellardyke, Web, WordPress2 Comments on It’s all changed… and yet nothing has. Oh yeah, I meant to say, we have seven people sleeping over tomorrow night. There is a buzz in Edinburgh during August; there is life and energy and creativity. My fondest memories of Edinburgh during the Festival are in the company of Danny Wallace and his Joinees, many of whom have now become firm friends. Sitting in the Pear Tree House garden, of an evening, laughing and marvelling at the tricks of Magic Eric. Or the truly surreal experience of attending a lecture on Creationism at Carrubbers on the High Street in the company of comedian Dave Gorman. And how could I ever forget my experience last year with Steve Lawson and Cath staying for the duration of Steve’s solo bass show? The loveliest, and noisiest, midnight mice we’ve ever had. But who are now two friends that I love very dearly indeed. So this year, we’ll have to make purposeful forages into the city to absorb some of that buzz, and fun and excitement. Here are two not-to-miss shows. Sunday 6 – Saturday 12 August (not 7th), 23:00 at The Lot. Book tickets. I’ve heard some of the demos that Steve recorded while rehearsing with Julie for this, and this promises to be a fantastic gig. You can check out a few of the tracks on their MySpace site at www.thenewstandard.co.uk. Saturday 12 – Friday 18 August, 12 noon, at the Laughing Horse @ Jekyll & Hyde. Book tickets. 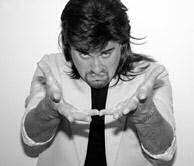 Mullet-haired Monrokvian magician, ‘Kockov’, is ‘a deranged Derren brown-style’ mentalist. His comical show displays amazing mental powers. Real magic, real powers, real funny. Unmissable – free entry. Adult only. This is a show by my National Youth Choir of GB friend Jasper Blakeley, one of the funniest human beings I know on the face of this planet. And for all that I know, the face of any planet. Check out the first Edinburgh Food Festival being organised by another exNYC friend of mine, Andy Williamson. It’s time that good food was up there with jazz, comedy, film, literature and all the other fine arts that we call culture and CELEBRATED with its own festival. What better place to do it than in Edinburgh, the festival capital of the world, and what better time than August, when the city is full to bursting with hedonists and culture lovers from all over the world? We’re not limiting ourselves to two senses, however! As well as the fabulous tastes and appetising smells from freshly cooked delicious food, we’ve got great live music, a daily market, a resident poet to stimulate your brain cells and we’re organising conversations and demonstrations that you can just drop into. Those are the shows that I’ll be catching. What about you? 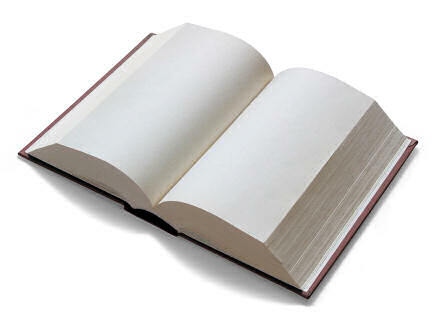 I’m going to call the book A Writer’s Block Tribute to Mahjong. Only kidding, but I do wish that I had more energy. As much as I’m enjoying the discipline and new rhythm to life, this ‘proper job’ 9-5 routine is rather tiring. It’s either that or something to do with my not having had a break since February, when we visited the lovely Steve and Cath in London Town. The last few undocumented-by-blog days have been very productive and very exciting, albeit very hot. My office has a couple of 15 ft windows that don’t open, and no fans. I’m half tempted to go and work in the server room next door, which has air conditioning to keep the shiny, flashing boxes cool. In terms of work, this week has been really quite exciting, and our work-load is set to increase even more. I wish I could say more about what we’ve been up to than I can. 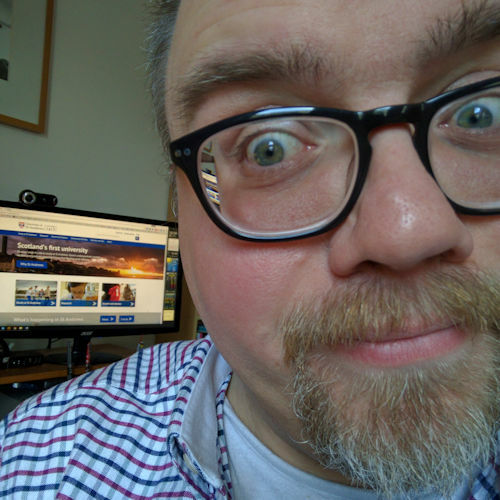 What I can say is that this week, like most weeks, has been spent working on both the big picture of what is to come in the website redesign (we’ve now estimated that we have around 10,000 pages to somehow squeeze into the new site!) while also working on smaller redesign projects as interim stages towards the Brave New World. I won’t say any more, but will wait until it’s all done and launched and then you can see for yourselves. Patience… patience…! All good things come to those who wait, and all that. In the meantime, I’m off for some sleep, and to read this interview with Steve Lawson. I’m back up at 06:00 to do some more writing. 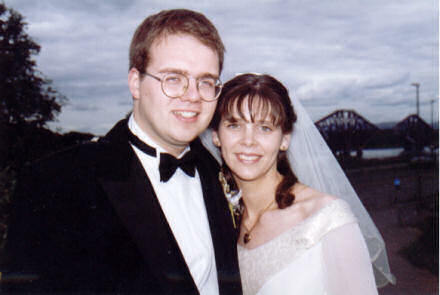 Gareth and Jane on Sunday 25 July 1999, standing at North Queensferry, against the backdrop of the Forth Bridge. Happy 7th Wedding Anniversary Jane, I love you.